This wonderful girls night in tapas party was submitted by Alice of Styled-It. Tapas parties are meant to be fun and chic, and and it is evident that this party was just that. The fantastic thing about a tapas party is that most of the preparation can be done ahead of time, taking away last minute stress and panic. The casual atmosphere of a tapas party also makes it a perfect evening for guests to relax and it is a fantastic theme choice for a girls night in. Alice said about the party planning: “I hosted a girls night in during early December, right in the midst of the holiday craze. I chose to do a simple ornament exchange, something that would not consume too much time or energy for my guests who all had very little left at this point! Step 5 of the party planning checklist focuses on the decorations. With this party held at Christmas and having an ornament exchange theme, there were Christmas decorations tastefully scattered around enabling guests to get into the Christmas spirit. Having an activity at your party will give it a unique vibe. This party was held at Christmas time, so it was perfect for a present swap. This idea can however be tailored to any girls night in parties you wish to hold. As this party was held at Christmas, each guest brought an ornament for exchange. If holding for a girls night in throughout the year, why not ask everyone to bring their favorite sweet treat, pamper product, or favorite type of accessory. A lot of fun could be had with thinking up the theme for this activity. Alice said “Each guest was asked to bring a wrapped ornament to put on display. Each guest then drew a number out of a hat and the person with the lowest number (#1) was first to select a gift, unwrap and display it. The second person (#2) had the option of either selecting another wrapped gift or stealing one of the unwrapped gifts. Anyone who had their gift stolen then chose to select another gift or steal again. This continued until the last person had unwrapped a gift”. This activity can cause a lot of laughs and is something incredibly simple and fun, making it perfect for a girls night in. If you are having a dinner or a tapas party, step 7 of the party planning checklist will be one of the most important. A tapas party is an ideal theme for a social gathering giving guests a delicious array of finger foods that they can enjoy at their leisure. Ideally five to six different tapas dishes should be served that are quick and easy to prepare. Alice made the tapas herself which were served in a combination of shot and martini glassses. 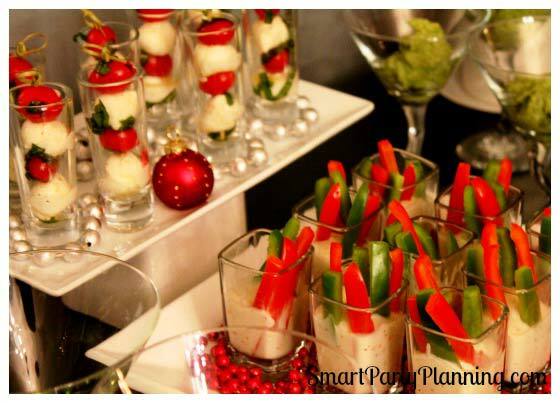 A caprese salad was served in the shot glasses as well as red and green bell pepper strips in a vegetable dip. Two dishes were served in small martini glasses. The first was a roasted red pepper hummus with thin sesame flat bread sticks. The second was sauteed shrimp served with a spicy tomatillo sauce. In medium sized martini glasses were two chicken flautas in guacamole and garnished with cilantro. For drinks, guests were served eggnog in shot glasses which were garnished with mini candy canes that changed the color to a bright pink. To achieve this look, the candy canes were sat in the eggnog and refrigerated for at least 20 minutes. Other beverages also served in martini glasses were mini milk shakes made with strawberry ice cream and whipped cream, and candy flavored cosmos with a gummy candy skewer. Has this tempted you to hold your own girls night in? What are your thoughts on holding a tapas party, do you think this is something that your guests would enjoy? If you like this article, please consider sharing it with your friends. You can also keep up to date by subscribing to Smart Party Planning.